With a better design and stronger specs, the Kin Two (Verizon; price TBA) outshines its sibling, the Kin One. But it isn't perfect: Limitations and omissions within the software keep it from being a threat to lower-priced smartphones on Verizon. Design-wise, the Kin Two is much more attractive than its squat sibling. It has a larger display and roomier keyboard, as well. In my hands-on tests, I found the keys comfortable to press and nicely spaced. It isn't on par with the Sidekick, but it comes close. I was impressed with the Kin Two's 8-megapixel camera. I took a few snapshots at the launch event, which took place in a dimly lit nightclub, and was impressed with how powerful the flash was. Faces were nicely highlighted without being completely blown out. Details appeared sharp and colors looked fairly natural in my test shots. The Kin Two also captures HD video, which I unfortunately didn't get a chance to test out. While it's a bit overwhelming at first, Kin OS is visually-pleasing and incredibly easy to navigate. The main screen, called Loop, displays your selected friends' status updates and messages as well as your favorite RSS feeds in a colorful collage of text and images. Flick to the left, and you'll see a panel of all your applications; flick right, and you'll see your contacts. I also liked how easy it was to share photos with your friends via the Kin "Spot." The Spot is a green circle that sits at the bottom of the user interface. If you want to share a photo, video or news story from your RSS feed, you simply drag and drop it into the Spot. You can then tap the Spot and decide whether you want to send it to your friends or upload it to one of your social networks. Another highlight: The Kin Two ships with the Zune HD media player for video and music playback. There's also an FM radio. The OS was a bit sluggish while I was navigating through various menus, but this might be due to the fact that my test units were preproduction devices. I'll make a full assessment once I get my review unit. When you capture photos or videos on your Kin phone, they're automatically uploaded to the Kin server. You can then log into your Kin Studio account on your PC to view and share your media--no USB cables or microSD cards to hassle with and no tedious uploading procedures. This is an ideal feature for the non-tech-savvy audience Microsoft seems to be targeting with these phones. But there's one disturbing problem with the Kin Studio: You can't delete photos off your phone without deleting them from the Kin Studio. In some ways, Microsoft's explanation for implementing this makes sense. If a user wants to delete, say, an incriminating photo from a bar the night before, they probably want it completely erased from existence. But if you're simply deleting photos to free up some storage on your phone, this is a big problem since the Kin Two's memory is restricted to 8GB (there's no microSD support). 8GB might seem like a lot, but you'd be surprised at how quickly that fills up with HD videos, photos and music. I also wish there was some sort of photo editing or video editing software built into the studio. To edit a clip or photo, you have to download it to your PC first, edit it in a third-party program, then re-upload to the Kin Studio to share with your friends. Unfortunately, the Kin OS is missing some features that, in my opinion, are crucial for social networkers. First of all, there's no native calendar nor is there support for syncing your Outlook or Google calendars. If Kin's main goal is to connect people together, then why isn't there a way to create and share events via a social calendar? There's also no native IM client, which seems strange for a phone that's built for messaging. Lastly, Kin lacks support for uploading photos or videos to Twitter. You can upload videos to your Facebook or Myspace profiles, but forget about Twitter. Microsoft says that it might be adding these features in future over-the-air updates, but don't expect them at launch. Also, if you're a heavy app user, you'll be disappointed to learn that there's no software development kit currently available for the Kin phones, nor is there an app store. For now, you're stuck with what's preloaded on the device. Right now, it is hard to estimate how well the Kin Two will do without a price attached to it. While it has some "smart" features, this isn't a smartphone. 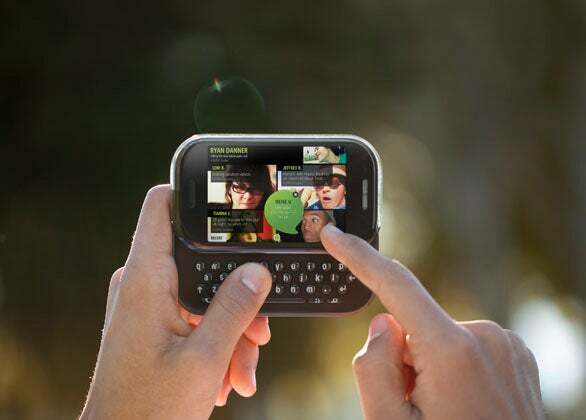 More advanced users might be happier with sub-$100 smartphones like the HTC Hero or Palm Pre Plus, also on Verizon.